Professional, reliable, and community-focused are the qualities that best exemplify EMSA Paramedic Chase Coates. Chase was nominated multiple times this year, and the same descriptors—leader, teacher and role model—came up repeatedly in the nominations. He is well-liked and deeply respected by his peers and supervisors. Chase joined EMSA in July 2010 while he was completing his zoology degree at the University of Oklahoma. He had intended to become a physician, but fell in love with pre-hospital medicine and the EMS industry. 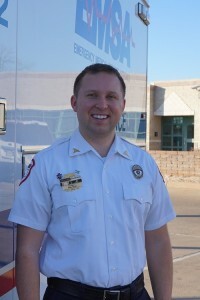 In January 2013, Chase was promoted from EMT-Intermediate to Paramedic. He is a founding member of EMSA’s Community Ambassadors program and, as such, conducts dozens of presentations each year at schools, has organized clothing drives for the homeless, and represents EMSA at various public events. Chase also is a Field Training Officer and serves on both the honor guard and tactical EMS teams.